As you can see, it’s a basic Windows Store app and just integrates a simple layout with the GridView control. I’ll give you a brief overview of how the app works and how you could get started with our APIs in Microsoft’s new app model. This post will be focused on getting the relevant Google+ Data using the REST API. Please note that this is an early version of the sample, various best practices are not being followed but updates to the sources should address these in the future. A key concept demonstrated in this example is authentication. Because the most exciting Google+ APIs from the perspective of Windows Store apps require that you be granted permissions by the user, you will probably be most interested in this step. Let’s go over how authentication will work for this app. Some of the steps are made much easier because of new APIs for Windows Store apps. However, I had trouble using the .NET client library because some of the referenced classes were deprecated for the new app model. I’ll be looking into what can be done to make the service generator build compatible libraries. Without further adieu, let’s talk about data, starting with authentication! // TODO: switch off button, enable writes, etc. // Could be really useful to print debugging information such as "Your applicationID is probably wrong"
In the above code snippet, we setup an HTTP POST request and then send it to the Google authorization server with the parameters we need for authentication. The response data from the call contains a parameter for the access token as well as a refresh token. The following code snippet shows how the access token and refresh token are parsed from the response. In the above code, the parameters are extracted from the response data and parsed with a few simple string split calls. The refresh token is stored for later and the access token is cached for API calls. Because the parameters used for exchanging an access code for an access token/refresh token are very similar to those used when exchanging a refresh token for an access token, this method is reused later to get access tokens from the refresh token. At this point, you have used the access code to get a refresh token and access token. Now you’re ready to make authenticated API calls to Google+. In order to perform authenticated API calls to Google+, you need first to have gotten an access token. This was done in the previous steps and is cached within the application. Next, you will make the API call using a HttpClient. Finally, you will be serializing the objects from JSON. The first step we’ll discuss is specifying objects to be used later for JSON serialization. Before you can parse JSON data from API responses, you need to specify the objects that will be parsed from the API call responses returned over REST. You can generate these classes from the discovery document. Because this was just an exploration of Metro and a demo, I hand crafted a few of the classes as opposed to writing a generator. The following example is the ActorClass and it’s child classes, which are returned within the activity feed and the people APIs. The classes and interfaces are specified using a shorthand that is common in C#/.NET for data contracts. Now that we have our objects for serialization, we’re ready to get the profile data and then serialize it to the actual objects. Here’s our favorite authenticated Google+ API call, getting profile data! First, we’ll need to specify the template that will be used by the JSON parser for storing the user’s profile object. This was described briefly in the above section. Next, we’ll perform the RESTful query using the HttpClient. Finally, parse the profile into the object we specified earlier. You can see the profile information for me in the object. This can be used later to render personalized data for the signed-in user. In my app’s case, the code behind just sets up the XAML objects based on the Actor object. It’s really not that hard to run the REST flows from Windows Store apps. I think a logical next step for developers working on Windows 8 with Google+ is to implement a share contract because that would be really useful for users. Let me know if you have any questions about the sample! I’ll try and document the rest of how things work and how the UX works, but no guarantees because this is lower priority for me for now. Finally, for y’all in the U.S., happy Thanksgiving! I hope you’re having a great time with your family and friends. Would you help me to fix the questions? thank all. In the parseAccessToken method. Next, look at what the value of content is by hovering over the variable. What should be in the response body (and content string) is data for the access token. If this is invalid, you will get the 401 errors because you don’t have an access token. If the content is there, step through and see if the value access token is there and then start debugging the API calls that are retrieving data. If the access token is not being returned in the parse access token, the response will have more information about what’s going on. But if I need to programmatically insert a moment inside my windows store app, how can I do it? https://plus.google.com/apps/activities is really handy when debugging app activities! What’s the chance of you updating this sample code to allow the app to be a Share Charm target? 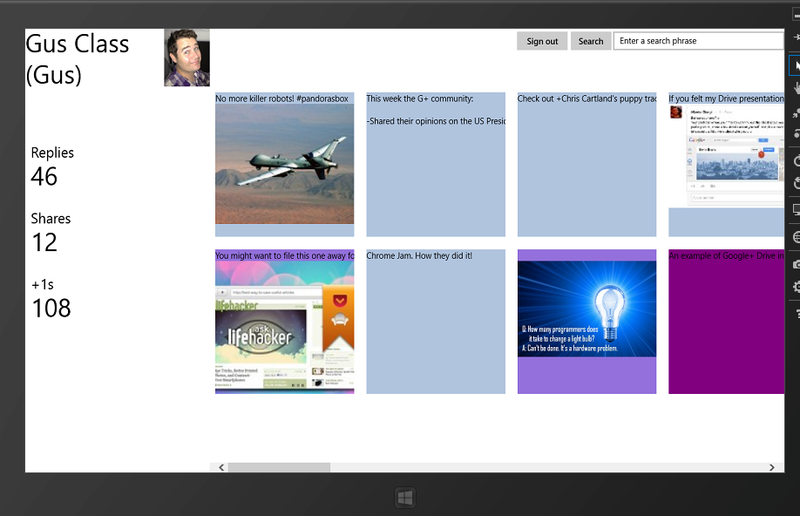 One thing I miss sorely on Win8/WP8 is the ability to share content to G+. how get email of user from token + userid ?